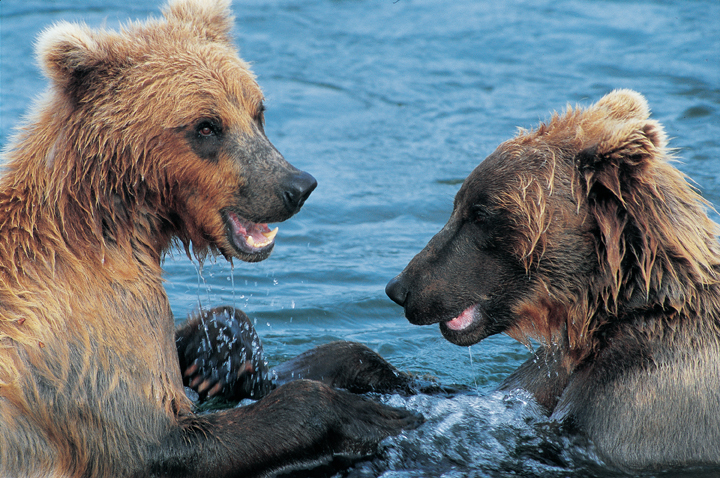 Grizzlies in Brooks Falls, Alaska. Photo by Steve Morello. If you’ve ever contemplated an adventure trip with “nature” as the keyword, you’ve probably come across Natural Habitat Adventures. The Boulder-based company is the Conservation Travel Provider to World Wildlife Fund. It’s been named a “2009 Best Adventure Travel Company” by National Geographic Adventure and a “2009 World’s Best Tour Operators & Safari Outfitters” by Travel + Leisure. Founder and director Ben Bressler has a “fun” mandate at his company. That mandate and his eco-practices have led Outside magazine to dub Natural Habitat a “Best Place to Work” for two years running. 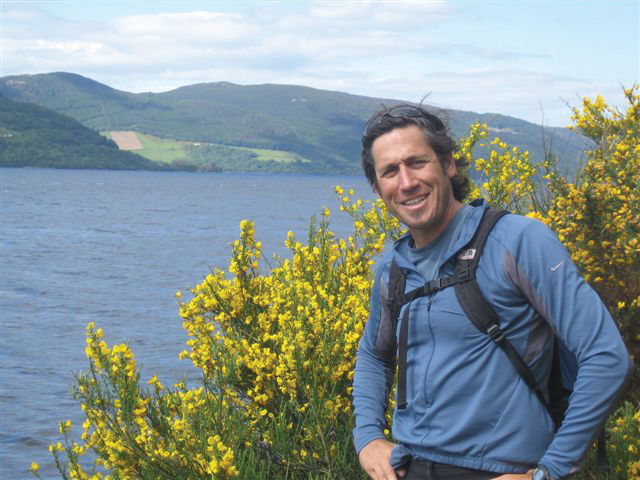 I caught up with Ben on the eve of the Adventure Travel World Summit in Quebec, which we’re both attending next week. What is it about you that drove you to start Natural Habitat? I couldn’t find a job! Seriously, I was a history teacher and I was not a very good one at that. I took a group of kids out West skiing and earned a little money and I immediately thought I’d start a business escorting adventure groups. I had absolutely no idea what I was doing, but I knew I loved being out in nature and I knew I was not terribly qualified to do anything else. So I drove a garbage truck at an amusement park in New Jersey and saved $600 to start the company. Needless to say, with that kind of seed money it took a long, long time to get started. What are the essential skill sets one needs to make an adventure business a successful business? A passion for your specific segment of the industry is number one. Then, if someone were starting a business today, I’d say learn accounting and learn the Internet. But, again, without the passion, just give up right now you’ll only fail. On the Natural Habitat website, you state “Our trips are not for everyone!” Why? 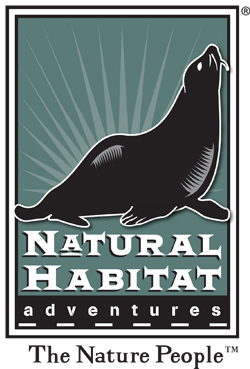 Natural Habitat’s tag line states that we are “The Nature People.” Our trips are focused on bringing interested travelers on the world’s greatest nature expeditions. While our expeditions are offered in the luxury price range, we spend guests’ valuable money and time pursuing great nature experiences, like living out on our specialized Tundra Lodge in the midst of polar bear habitat; flying further afield into the Kalahari Desert; and traveling all the way into Denali National Park where the wildlife is rather than staying at perhaps more luxurious lodges where the people are. Getting out amidst the world’s greatest nature sights isn’t easy or cheap, but it’s what we do, and if guests prefer a high thread count over a high animal count they’ll just be disappointed if they travel with us. 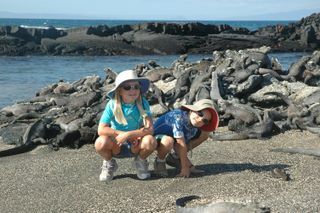 Kids exploring the Galapagos. Photo by Emily Supernavage. How have you seen the world of adventure travel change since Natural Habitat was founded? It has changed a ton. There are so many companies out there, and it has become so specific to niche activities, destinations, etc. 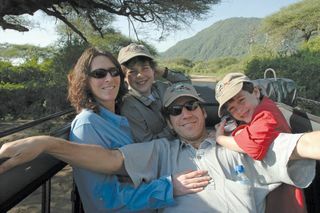 Luckily we’ve always been focused on nature expeditions — it’s what we’ve always loved and what we’ve always done best. But other companies who generalized more — spreading business out among walking tours, safaris, or train trips — have seen small, focused companies who specialize in one area cut into their business. And why not? Just because I know a lot about running nature trips does not mean I know anything about bicycle tours or culinary tours or hiking tours. They are all so incredibly different. If you want to be the best, then do one thing only! 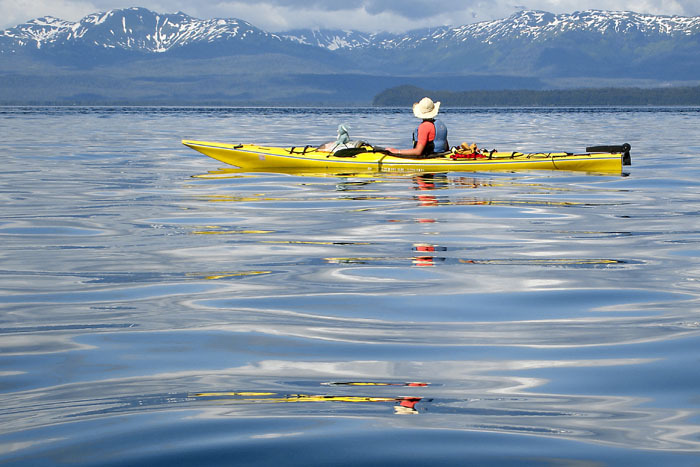 There are dozens of adventure travel companies out there. Why should someone consider Natural Habitat for their next trip? Well, first, if they are considering us for anything besides a nature expedition, we’re not the right match. We only do nature expeditions and, again, that’s why I think we’re good at them. So why select us for a nature trip? Because if a traveler wants to see what our planet is truly about and has a burning desire to delve into the world’s most astonishing natural sites, we truly share their passions. As such, we arrange our trips as though we are arranging them for ourselves or our family or friends. Our trips are about “the experience,” and while we surely offer high levels of comforts where possible, we will not miss a wonderful nature sight like dawn among the wolves of Lamar Valley, or bears fishing for salmon on Brooks Falls just because the nearest accommodation may be a little more rustic than a 5-star resort. With us, the experience trumps the amenity. 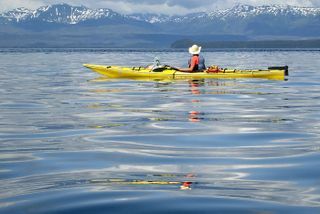 Sea kayaking in Alaska. Photo by John Baston. How are you dealing with price-sensitive clients in this tough economy? The economy is having a greater affect on our planet than one can see in our own businesses or our own bankbooks. Many communities and animals and habitats around the globe depend on tourism for their life blood, and without visitors the environment and the people will be deeply negatively affected. In fact many conservation efforts are dependent on eco-tourism as well and without our travelers’ dollars those efforts will simply fall by the wayside. With that in mind, we worked with our local operators, hotels, transportation providers in various destinations to collectively lower our prices in a program we call “Eco-Pricing” with the goal being for all of us to contribute to the reduction so our guests could afford to keep traveling. You’ll see our Eco-pricing logo all over our catalog and website, and we have had a great response to those efforts. It is not a discount for discount’s sake; it’s clearly tied to our broader environmental mission, and people seem to respond to the deeper message. It is, rather, a collaborative realization that times have changed and in order to continue to do the things we believe deeply in we must pull together and make it happen. What trips are popular right now? Surely the more remote destinations have fallen off a bit and the closer ones have done better. For us, our polar bear trips in Churchill, Canada, have been, well, hot! The very real threat that these animals will not fare well in the near future has put a spotlight on them, and folks want to come face to face with them while they can. It is a wonderful eco-tourism story in that those who visit them cannot help but return home and support the fight to end climate change. You tend to protect the things you love. Any new destinations for 2010? We’ve got nearly a dozen new tours including our first time sharing our home state of Colorado with our guests; and we’ve got a “Wild Japan” tour that leaves in January it’s unusual in that it provides a rare focus on Japan’s wildlife, including the chance to sit with snow monkeys in their natural hot springs habitat. 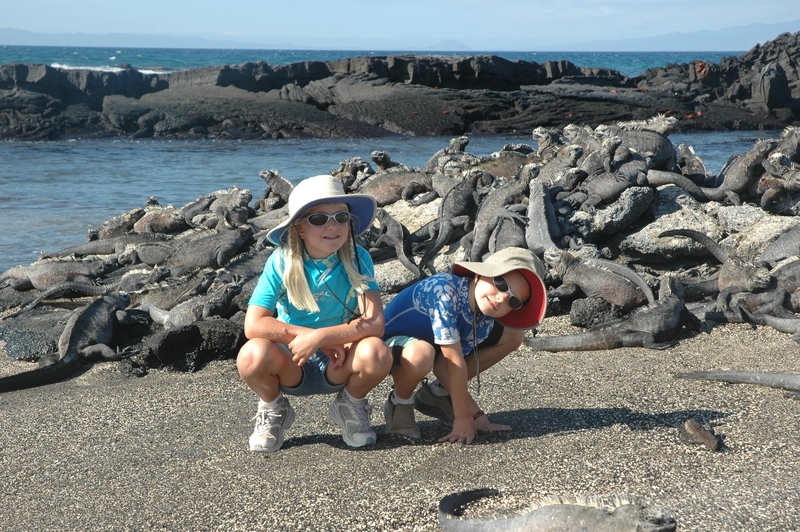 A favorite of mine is not so much a new destination as a new approach: our Galapagos by Land adventure. I’m not so good at sitting on a ship so we arranged a lodge-based Galapagos expedition with day boat excursions as well as hikes. It’s a great trip. Give it a shot. And that said, for those who like boats, we’re also offering for 2010 a Galapagos trip aboard the Nina. It’s a new luxury catamaran — very stable and fast and with a really low guest-to-guide ratio. Ben Bressler on safari with his family. What can’t you leave home without when you travel? My ExOfficio travel shirt. Keeps me warm when it’s cold out and cool when it’s hot. And I can roll it in a wet ball for three days then shake it out and it’s not too wrinkled. What’s on your short list of places you’re dying to visit? And why? Bhutan. It’s a Himalayan country focused on nature. While it doesn’t have a load of animals bird life and some rhinos in the south might be the most prominent their entire culture is based on the relationship between mankind and nature. Plus I can’t wait to have a beer on a porch overlooking the tallest mountains in the world.